Any size. 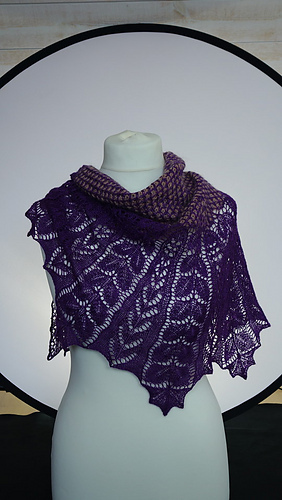 Cast on more sts for a larger and less for a smaller shawl. This is the two colour version of Meadow in the Woods. If you buy or have previously bought Meadow in the Woods, you will get this one for free (put it in your shopping cart). Difficulty: Advanced to insane. (Test knitters told me it wasn’t that bad, actually, so there’s hope.) Pattern on every row. Two colours worked in the body section using short rows (only one colour worked at a time, however). Yarn: Shown here in main colour Zephyr Lace Weight by Fantastic Knitting, 50/50 Merino/Tussah, 630 yds/2oz. 3oz needed to make the shawl as shown. Contrast colour: here was used some left over mohair lace yarn, 10 g or 65 yds/60 m, but any yarn in a contrast colour may work, as long as it knits up in something close to the same gauge as the main colour. You can of course use a second colour of the same kind of yarn as your main colour yarn. A fun way to make a contrast would be to use both ends of a gradient. 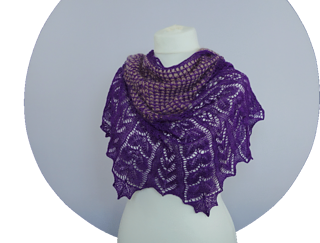 Construction: The shawl is worked from the bottom up, using either long tail or crochet cast on. The last 19 sts are either grafted together, or bound off using a 3-needle bind off. 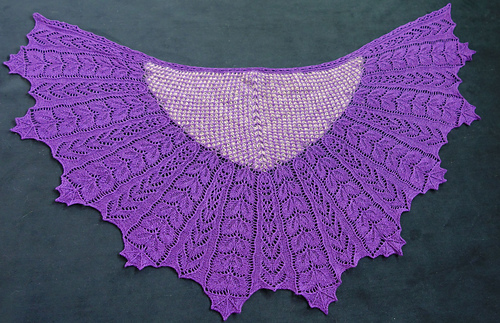 Shawl is shown with 3-needle bind off and long tail cast on. Size: As shown 23 inches (58 cm) deep and 45 ¼ inches (115 cm) wide. Size is adjustable, you can work any number of stitches divisible by 98 + 34 (the amount of yarn you will need will of course change accordingly). Needles and hooks: US 2½ (3 mm) circular needle or the size you need to get a fabric you like. Crochet hook in the same size for the cast on if doing the crochet cast on (Chinese Waitress). Spare needle in the same size if you wish to work the 3-needle bind off.